Puma know how to put together a lightweight boot, but just to further prove their technological prowess, they have made their already light boot even lighter and here it is, EvoSpeed 1 SL. 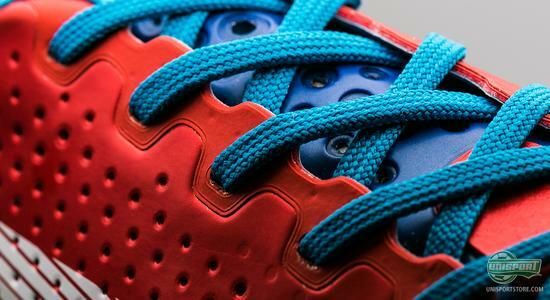 It weighs an astounding 154 grams and now it has also landed in the already very popular Red/Blue/White colourway. 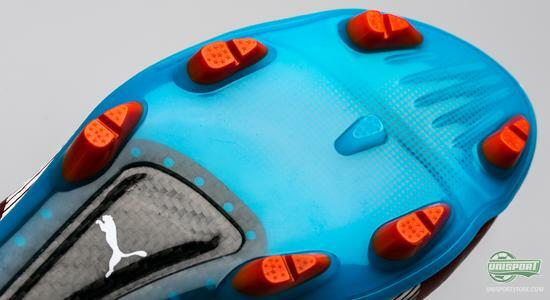 Pumas speed boots have been very successful in the last couple of years and this is very much illustrated by the impressive line-up of players, who all apply their trade in their EvoSpeed-collection. 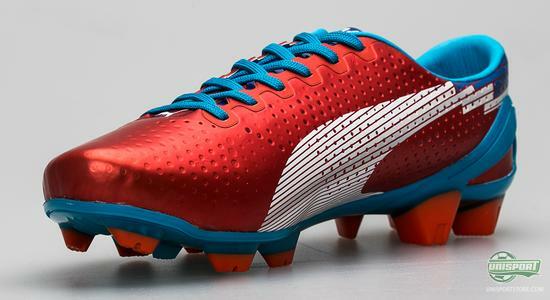 Radamel Falcao, Sergio Agüero and Olivier Giroud is just a small handful of the superstars, who all prefer the Puma lightweight, but we will probably not see any of them in the formerly mentioned Puma EvoSpeed 1 SL, even though that would be some sight to behold. The 154 gram Puma EvoSpeed 1 SL comes in the same colourway as its regular namesake, which we looked at earlier in the week and that is a choice you definitely can't fault Puma. 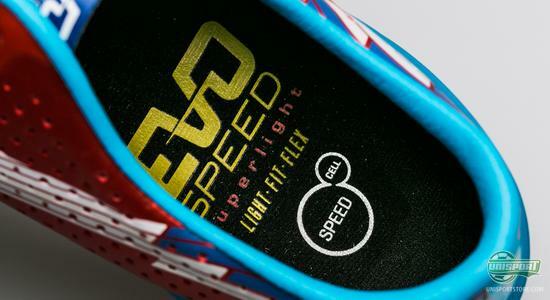 It looks incredibly sharp in the red, white and blue colourway, but unlike the regular Evospeed 1, the SL-model has a little more shine to it, which adds some edge to the already sharp outfit. It is hard to miss that the upper has been perforated and even though this might have its downsides, when playing in the rain, it works wonders for the weight. 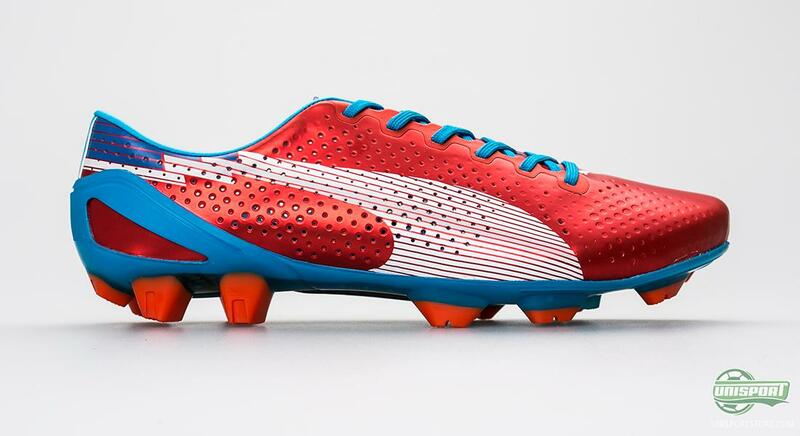 154 grams tells its own story about the Puma Evospeed 1 SL, because it really is almost unfathomable, how light it is. It actually makes it the lightest boot on sale right now. 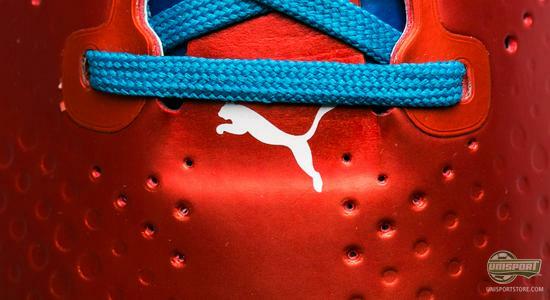 The upper on the Puma Evospeed 1 SL is made from a Japanese microfibre, which straight out the box is soft and flexible. On top of that it is naturally also unbelievably thin and you can therefore expect an absurdly good touch on the ball. You should however not expect very much protection from knocks and kicks, so if this is something you weight highly, we recommend that you look into a pair of Metasox. Puma EvoSpeed 1 SL is the third SuperLight-variation, the German brand has produced and once again they manage to move the boot in the right direction. 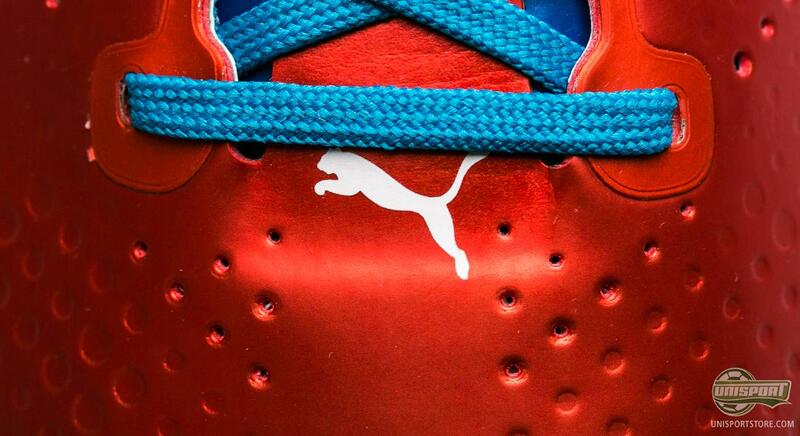 Puma keep a hold of the things that really work and then refine the things that need it. 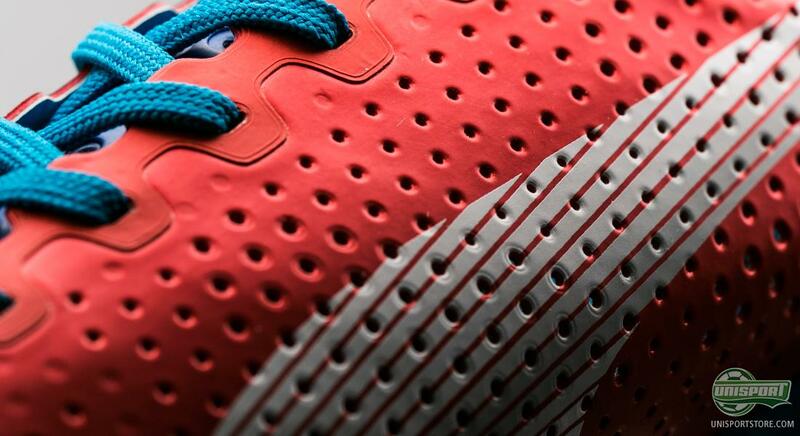 A good example of this is the perforation of the upper, like we also saw on the predecessor, Puma v1.11 SL; now it is back, new and improved, to increase the friction between ball and boot. Both the stud-configuration and the outsole is the same as the one used on the all time classic v1.11 SL and this only a positive thing, as both were great success. The Pebax-outsole is not just incredibly light, but also very flexible around the front foot. 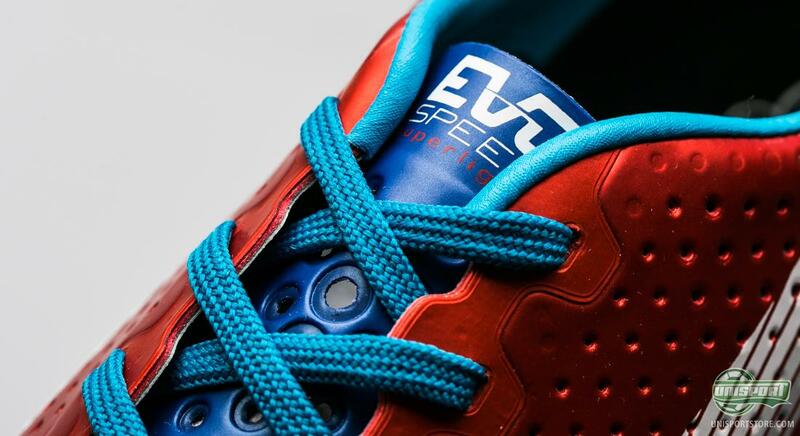 This will also help your acceleration  and to make sure you take full advantage of all your power when you kick off from the ground, there has been used carbonfibre to reinforce the sole. 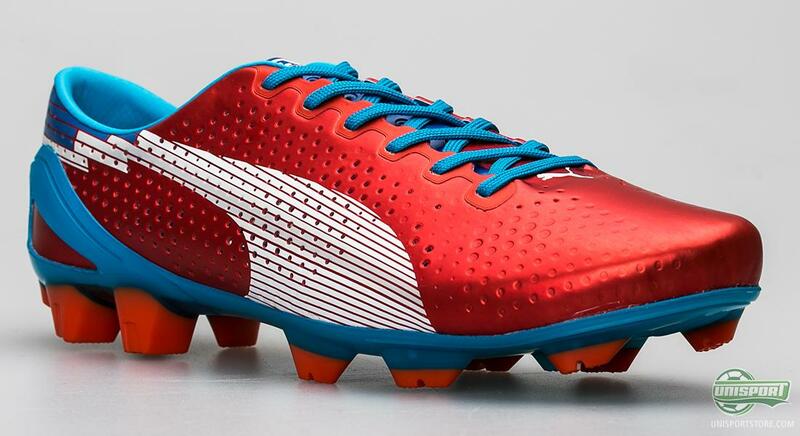 It is hard to find a better alternative for spring, than the Puma Evospeed 1 SL Red/Blue/White. 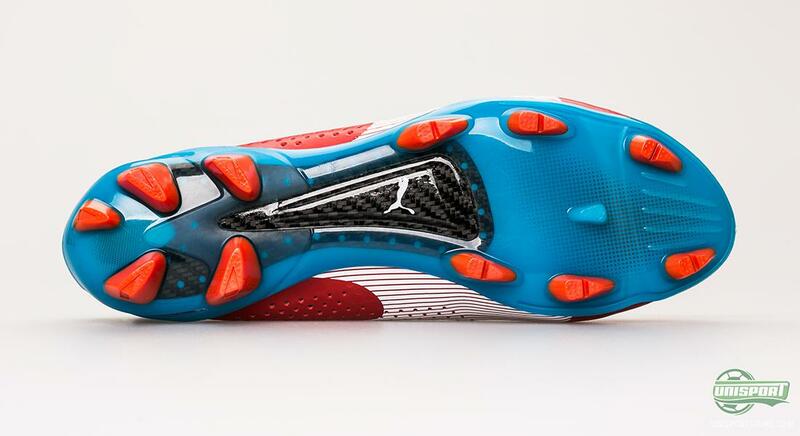 154 grams of finely tuned superboot dressed to impress, in an elegant colourway. Is it something you might like? Share your opinion of the boot in the comment-section down below.